Kevin J. Ahearn, 19, of Galloway, was arrested on May 13by Ofc.Ronald Gorneau for possession of less than 50 grams of marijuana. Timothy L. Chester, 31, of Galloway, was arrested on May 13 by Ofc. Ronald Gorneau for DWI following a single vehicle accident. Ida Rodriguez, 27, of Galloway, was arrested May 13 by Ofc. Christian Magazzu for hindering apprehension. 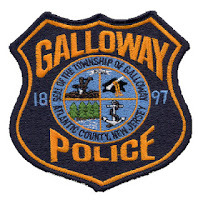 Derek D. Gibbons, 21, of Galloway, was arrested on May 14, by Ofc. Justin Butler for hindering apprehension. Claudio Diaz, Jr. and Ryan Taylor, both 18 from Galloway, were arrested May 16 by Sgt. Mark D’Esposito for possession of less than 50 grams of marijuana. Michael S. Flaherty, Jr, 31, of Galloway was arrested May 17 by Ofc. Ronald Gorneau for possession of CDS, possession of a hypodermic needle and obstruction. Noelle Prusarczyk, 28, of Kunkletown, PA was arrested on May 18 by Det. Bryan Casey for theft. Michael J. Curtis, 27, of Vineland, was arrested on May 18 by Det. Jason Kiamos for two counts of possession of CDS. Eric M. Vaughn, 39, of Newark, NJ was arrested on May 18 by Ofc. William Kline for DWI.